"I'd say I do it for the challenge, but the truth is it's not that hard." What a curious ability, you might think. Make the Corp pick up an unrezzed ice or other installed card about 4 times per game? They'll just spend 4 clicks to put those cards back - and maybe a few credits for ice install costs, so who cares. Well, it turns out that with proper application, Leela's ability is incredibly strong. Let's have a look how. Firstly, the true value of bouncing cards (returning cards to the Corp's HQ) is the weakness that this can create in a server. For example, if early in a game, NBN fast advances an agenda and has only 1 ice on each of HQ and R&D. You might return the ice on HQ, then on your first click Account Siphon them down to zero credits, then on your next 3 clicks, hammer their completely exposed central servers with some combination of Legwork, Indexing, or Keyhole. Each agenda you steal will let you bounce another unrezzed ice back to HQ. It's not at all uncommon for a turn like this to earn Leela 4-5 agenda points. It's possible to build a control deck that doesn't run and just builds up credits, threatening to use Leela's ability for a blowout turn as soon as the Corp first dares to score. A great card for this style of deck is Logos, which can compound the threat by letting you go fetch whichever card will target their weakest server. Indexing if they have only one ice on R&D, Siphon for HQ, Sneakdoor Beta for Archives, etc. Initially, it may seem like the only way the Corp can protect against this is to install 2 ice on each central server before they can safely score, which can take a very long time to arrange. This only works because Corps are accustomed to scoring agendas in the safest way possible - fast advance a 3/2 or 2/1, or install a 3/2 one turn then fully advance it next turn, or IAA a 5/3 then AAA and score the following turn, etc. All of these patterns leave the agenda exposed the least amount of runner turns or minimise the investment of advancements, and are normally a good idea. However, savvy Corp players will realize that what these patterns have in common is that they score the agenda on their last click, which is what Leela is exploiting. So they can fight against a passive control Leela build by IA a 3/2, then AA score it next turn, and still have a click left to immediately put back whatever ice Leela bounces, avoiding leaving any server exposed for a turn. So against a high level player, a completely passive control build may find it never gets that turn of completely open access to a central server, and so falters. But all is not lost! If by playing Leela you can force the Corp player to change their agenda scoring pattern this much, you have still gained a significant advantage. They're committing more resources to agendas before you have a turn to try to steal them, and you've interrupted fast advance. So, a more rounded Leela deck may use the standard criminal tricks to still run some servers and apply other pressure in the early/mid game, while leaving just one central server alone to still threaten with her ability. You might run Inside Job and Femme Fatale to be ready to steal a slow-scored agenda from the remote when the Corp tries to play around her ability. Or you may opt to attempt to steal an agenda from a central server, then have Leela return the partially advanced card to HQ, wasting the resources that went into advancing that card. Crescentus is an incredible card to turn back on Leela's ability in a more aggressive Leela deck that is likely to have ice rezzed. An ideal example of when to use it is during a Legwork run or the second run off an Indexing to ensure there is a facedown ice ready to bounce from the agenda steal. With all the ice that is being returned, a cheeky Kraken can also often give the Corp a choice between exactly 1 ice to destroy, blowing another server wide open. Really aggressive Leela builds may even forgo Logos to use the always powerful Desperado to pressure more cheaply with early game runs. There is also a particular Corp archetype that Leela is very strong against, and that is advanced-card shell game, such as a Jinteki PE kill deck. These decks thrive on installing and advancing many cards unprotected in remote servers, threatening the runner with dilemma that they may be Ronins that will kill them if they don't run, or Cerebral Overwriters that will kill them (or as good as) if they do run them. This threat becomes very strong once there are two unknown 4-advanced cards installed. 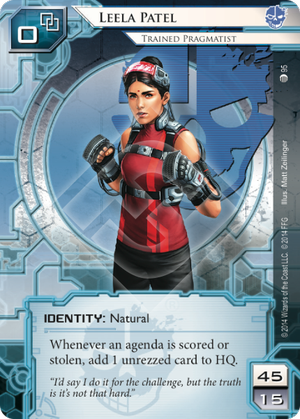 Leela's ability is absolutely crippling to this strategy, as she can just focus on stealing agendas from R&D then return any facedown advanced cards to HQ, destroying all the advancements in the process, and preventing the critical mass of advanced cards from ever occurring. In summary, Leela's ability forces nearly all Corporations to adjust their play strategy significantly, and she is one of the most powerful identities in the game. Also, there are many subtle ways to exploit her ability so the skill ceiling to fully using her potential is very high. I think this ID might be a meta-dependant hard counter to those nasty Cambridge-Jinteki: PE-Decks - when scoring or stealing happens, you bounce back those three-advanced unrezzed cards, be it a mushin'ed Ronin, June bug or Fetal AI.